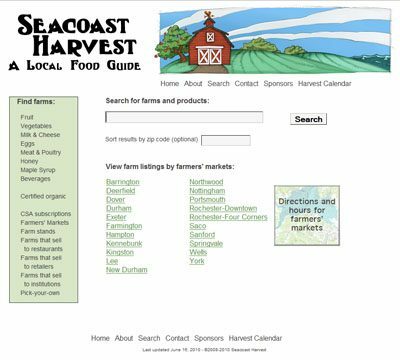 A search-able custom database for a non-profit's local food guide of farms in the NH Seacoast region. A non-profit group, based in New Hampshire, wanted to create a site that helped people find local farms. A large group of volunteers would gather information on local farms and enter the data into a GoogleDocs shared spreadsheet. This data needed to be integrated with a website. The non-profit created designs for the search page, search engine results page, and farm display page. My role as the sole web developer was to write the server-side PHP scripts for the site’s search engine and static pages. Using PHP, I created a system to transfer the spreadsheet data into an XML format which could then be uploaded to MySQL database table. I developed an XHTML site using a PHP framework. The complex search and farm display pages were implemented in PHP. A search engine was written in PHP to search for data by keyword, category, and zip code in the MySQL database. "Andy worked with Seacoast Eat Local to turn our print publication into a great website. Andy was very responsive and had a quick turn around time while also paying great attention to detail. He understands that little things can have a big impact of usability and was able to translate general requests into great functionality. He had good suggestions to make our project better and was easy to communicate with. We were very please with our website turned out and it continues to be an excellent reflection of our organization and Seacoast Harvest."